Survivors Have Said "Me Too"
Now what should their perpetrators say? “Hey, I have a really serious question for you that hasn’t been addressed ever,” reads the text on my screen from a boy I haven’t spoken with since high school graduation. It is fall and I am sitting on my couch, watching Christine Blasey Ford testify on live television. I laugh. Laughter is all I can manage after three years of processing what this boy did to me. It is all I can manage after years of therapy and countless nights spent wrestling with the concoction of guilt and disgust and confusion his abuse has caused me. And now he wants to know if this was assault. He feels guilty. He hasn’t processed what has happened—he needs me to do that for him. And as someone who has been taught to do men’s emotional labor for them, I do. I tell him that yes, what he did to me was assault. He isn’t offering excuses, he isn’t attempting to justify his behavior, he isn’t asking for forgiveness. He is simply sorry. And suddenly I am filled with rage. The damage has already been done—no apology can ever change what this boy has put me through. The only way I have been able to persevere as a survivor is to demonize him, to define him by what he has done to me. Maybe this isn’t fair, but it doesn’t have to be. Trusting my own narrative is how I survive. I have no room for the needs of someone who has caused me so much harm. And now this boy, who had already stolen so much from me, takes the only thing I feel I have left: my agency to hate him. The #MeToo movement produced many apologies, and by now, we are familiar with the way they sound. Apologies can serve as neat and just conclusions of an otherwise turbulent storm. When Louis C.K. publicly apologized for sexually assaulting five women last fall, Americans responded with a mixture of satisfaction and criticism. While some people were quick to critique the language he used or his motives, there did seem to be a general consensus that his apology was a necessary step forward. We were fixated on his actions, rather than the reactions of his survivors. 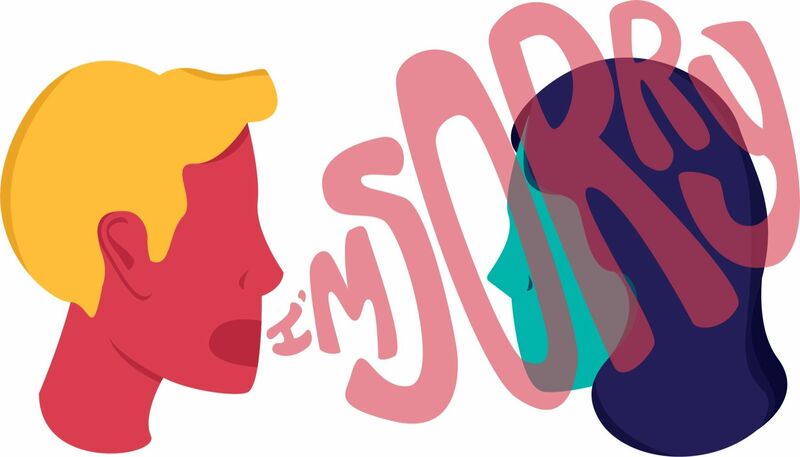 Of course, apologies are cathartic for many survivors and can be an essential part of the healing process. In response to Brett Kavanaugh’s infamous sexual assault trial, essayist Caitlin Flanagan describes her own experience with sexual assault in the Atlantic. Her perpetrator eventually apologized, enabling her to forgive him for his abuse. She writes, “He’d done a terrible thing, but he’d done what he could to make it right. I held nothing against him, and still don’t.” While this is an entirely valid response, apologies are not wanted by every survivor, a distinction Flanagan fails to make. She goes on to compare her experience with Christine Blasey Ford’s, which is riddled with complications: one survivor cannot truly speak for another. Every survivor’s healing process is unique and valid. Yet Flanagan extrapolates from her own experience, hypothesizing that the reason Ford is still traumatized from her sexual assault is because Kavanaugh never apologized. But this is not Flanagan’s conclusion to draw—just because she benefited from her perpetrator’s apology does not mean others must. To Flanagan, an apology is a box that must be checked on the to-do list of overcoming trauma—a step that will supposedly absolve the perpetrator and free the survivor. This troubles me for two reasons. First, I don’t believe perpetrators should be able to insert themselves back into survivors’ lives at their own discretion. Apologies, by nature, request a response from their recipient. And if this communication is unwanted by the survivor, it can feel like yet another breach of consent. When my perpetrator apologized to me, I felt as though my agency to choose how I heal as a survivor was erased. He chose for me, placing him at the center of my healing process. Whether he recognizes it or not, what he did to me has altered my life, and an apology—no matter how genuine—can never change that. Of course, some survivors need to hear an apology in order to move forward. But I felt as though my perpetrator’s apology was simply a means of relieving his guilt, serving only himself. For me, my abuser’s apology will always be a reminder that he can move past the mess he has made while I continue to carry this weight. Second, apologies provoke empathy that many survivors do not want to feel. The majority of victims know their perpetrators before any harm occurs, leaving many survivors vulnerable to emotional manipulation, or feeling forced to forgive. My perpetrator was my close friend at the time. I needed a ride home from a party, and because I had been drinking and he was sober, I trusted him. After his apology, I felt the need to placate his guilt. It would have been so easy. I had once cared about him, and his apology made me feel guilty for allowing him to wallow in his own remorse when my forgiveness had the potential to set him free. I was in the position to absolve someone I had once known and trusted. Was I evil to deny him that? While his apology may have granted him freedom and relief, allowing him to go “back to normal,” I do not share in this luxury. Survivors of sexual assault cannot go back to normal. To me, his apology was nothing more than an unwanted reminder of the burden I will always carry with me as a survivor—the burden that he placed on me. So, where do we go from here? The #MeToo movement happened, revealing names of those in power who we now recognize as perpetrators. Many of them have apologized or want to apologize to survivors. But we haven’t stopped to consider what these apologies demand from survivors, for instance, the burden of re-engaging with trauma. These perpetrators demand for us to empathize with someone who has caused harm. They demand even more emotional labor—yet another violation. The healing process is about the survivor, not the perpetrator. We must foster a culture that respects the agency of survivors and allows them to make their own decisions on how to continue on with their lives post-assault. Perpetrators must hold themselves accountable without depending on survivors to mediate that process; they have caused harm, and now they alone are responsible for it. They must confront what they have done, educate themselves, even if this process is emotionally taxing. This model reinforces the autonomy that survivors should have in deciding what is best for their safety and healing, and doesn’t allow perpetrators to ambush them with apologies they may not be ready for. I wish my abuser had never apologized to me. I wish he could have addressed the harm he had caused, grappled with his guilt, and become a better person without placing that burden on me. Two other people have sexually assaulted me, and I haven’t heard from them since. I have to say: their silence does make me wonder if they even know what they did to me. I wonder if they regret their abuse. I wonder if they have hurt others, and worst of all, I wonder if my silence enabled it. I am grateful to Christine Blasey Ford, and I’m glad that her testimony forced one of my perpetrators to confront the harm that that he caused me. But it enrages me that it took him three years and such extreme circumstances to put a name to his actions—and still, he needed me to do this work for him. It enrages me that on top of the hell that processing trauma entails, the person who caused me this pain is sorry. He wishes he hadn’t hurt me. Well, guess what—I wish that too. If you know me, you know I am okay. I laugh and I experience joy and I am okay. My trauma resides somewhere deep in my bones, and sometimes I feel it nag at the corners of my mind. But what happened to me is not who I am. I won’t let it be. I am defiant in the face of my trauma. I live to prove it wrong. And this does not make me a vessel for forgiveness or empathy I have no space for. I am focused on me, and my future. His journey is his own, and frankly, I want no part in it. MARIE LACHANCE B'20 won't take sorry for an answer.